That's a good question. Can you add a picture of the right side of the head? I'd like to see if there's a bracket for the reverse lever there. It's usually black, and functions as a limit for the reverse lever travel. Here is a related post you might find useful. You don't want to remove or bypass the reverse springs on a 563. You can hook up a foot pedal reverse via light chain. The simplest way is to operate it with your right foot. I have one on my 563, but ended up unhooking the chain because it's a hassle to remove when you need to tip the machine back. Plus it's super awkward to use your right foot. I learned on a machine with a left foot reverse so that feels more natural to me. However, it requires a rod with bearing blocks to locate the pedal on the left. It wasn't worth the effort for me. I actually really like the large reverse lever on the 563. It's so big you can't miss it. Juki LU 563 or new Sailrite Fabricator? I might be biased because I use a Juki 563 as my primary machine. It is built like a tank for an upholstery weight machine. I never weighed it, but it feels a good 5-8# heavier than a comparable Consew or Pfaff. I had been running it with a servo, and it worked great. I added a box style speed reducer recently, and it really feels powerful and easy to control now. If you look at the details of how a 563 is put together, it's quite impressive. I highly recommend this type of speed reducer. I've had the standard double wheel variety of speed reducer before, and depending on where it's mounted you may not be able to tip your machine head back. With this box style reducer, everything sits in just the right spot. No new holes in the table, and you can still tip your machine back normally. They perform great! Needle bar thread guide in place and intact? That is gorgeous! The color and texture of the leather play so well against that shiny red paint. Do the feed dogs seem like they're set really high? I've used machines that seemed to push the material forward slightly before feeding it backward. After going through the entire timing and adjustment routine, it was just the feed dogs set too high. That's the first thing I would check. Is this a CLPMN version 145 or something else? I've had a Consew 226's and they are an elegant machine. I too like the push down to reverse. I also had an older brown 1245 and was really impressed with it. The 1245 was one of the few machines that I feel as good sewing on as my Juki LU-563. Big bobbin top loaders. That's where it's at for me. The Pfaff has that. My 1245 built in bobbin winder didn't do a very good job (no tension discs) so I used a table mounted winder. My advice... Do your next two projects without thinking about it. Whatever machine you sit down at is the one to keep. Sometimes stats don't matter as much as what you like. Good luck with a tough decision. Building a table for Consew 206 RB —Help! Pintodeluxe replied to Mpuma's topic in How Do I Do That? I've made a custom tabletop for a Consew before, and it can be done. Mine was for a 226, but it's the same size opening as a 206rb. If you're handy with woodworking tools, it's easily managed. However, if it seems like more work than it's worth... it just may be! I had all the right tools and bits in my shop, so I decided to make a custom opening to fit my machine. I have switched the machine out since then, but still use that same table to this day. To size the opening, just make it slightly longer and wider than your machine. Here is my detailed blog on the subject with photos... http://lumberjocks.com/pintodeluxe/blog/112633 Good luck! 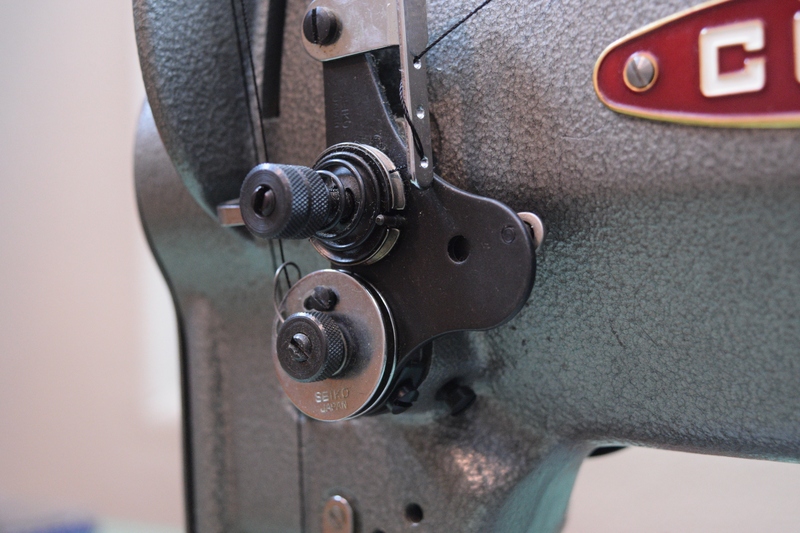 The 226 is a top loading small G style bobbin. You push down for reverse. The 206 is a side loading large M style bobbin. You lift the lever for reverse. The 206 is considered slightly more heavy duty, but the 226 is an elegant machine that wins in terms of ergonomics. I would pick the 206, but it's a close call. If it is a 145 it has an adjustment to raise the height of the feed dogs. Pull the manual to learn how, but as I recall it's pretty easy to do. It's probably just the knee lift mechanism is slipping off the roller as it engages the machine. That's a simple adjustment with basic hand tools. If the hand lift works normally, but the knee lift clunks, it's likely an easy fix. I'd go for the 563 for sure. That's what I use, and much prefer it over the 562 because of that huge U style bobbin. I agree with the others, I install the pulley so the raised "hub" faces the motor. The best tool I have found for the job is an impact driver and socket. It makes short work of removing the old pulley and installing the new one. Just make sure to wear gloves to save your hands. The Rex / Family type 550W servos work fine. I usually swap the motor pulley for a 45mm pulley. This slows it down even more. The dial will let you adjust the max speed. If it isn't slow enough for the work you do, then you'll have to add a speed reducer. I like Wizcrafts comments to lower upper and lower tension. Did you decrease the upper thread tension and decrease bobbin thread tension too? That makes sense to me as one fairly simple cause. The take up lever is trying to pull thread, but tension somewhere in the thread path won't let it. I assume you're using a standard thread cone on the stand.